Questions or elements are the body of a TouchPoint and are used to track a participant's progress through the program. On the navigation bar, click Site Administration. Locate the TouchPoint you wish to update. Under the Take Action column, click Edit. Navigate to the desired location of the new question and click Add Question. Choose the type of element you would like to add. You will have different design options based on the type of element you selected. Click Save to return to the body of your TouchPoint. Edit the element: Returns you to the element creation page. 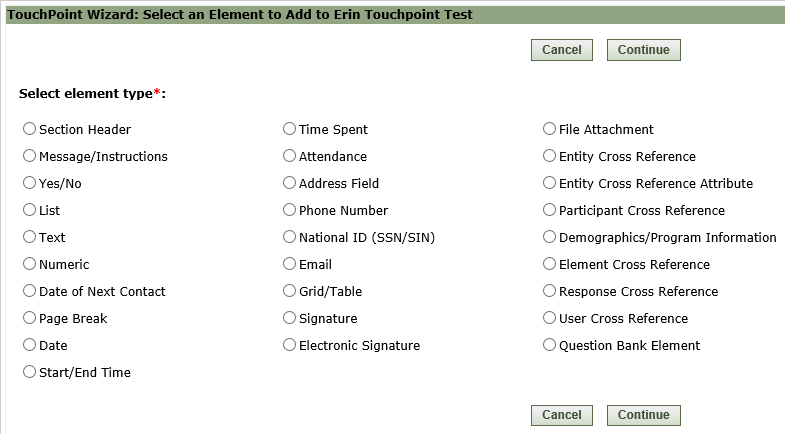 Make the question required when completing the TouchPoint. Move the question to a different place on the form. Copy the question: Useful if you are creating many of the same type of question and you only need to edit the text. Disable the element if it is no longer used. NOTE: Deleting the element will also delete any associated data. SSG does not recommend this course of action unless no data has been recorded for the element.